It should be quite a powerhouse, but Apple sure didn't help me as far as getting delivered swiftly even if I paid for expedited shipping. The configuration I wanted wasn't particularly exotic. Why doesn't Apple have a few of the more popular configurations in some warehouse in the United States? I got the shipment notice from Apple Thursday. It shipped from Lantau Island Hong Kong! It is already at a local airport but isn't scheduled to be delivered until Tuesday. Alas, my venerable MacBook gave up the ghost this week. The last Time Machine backup I have is from a week ago Saturday and my data logger only has 8 days and 21 hours of data. So to avoid any data loss I would really need the new computer on Monday. For the amount of money this computer is costing me, I think Apple could come up with a much faster way to deliver this item. As you've already noted Stu, Apple isn't what it once was. I finally retired a couple older Macs, although I'm still using the 17" Powerbook to access servers and stuff. I bought a Mac mini (actually two of them) and am almost finished transferring data, user account information, etc. I still have to move a few OSX mail mailboxes but that shouldn't be an issue. I have the .mbox files, so it's just a matter of doing the imports and organizing. The only surprise is that Interarchy V10 doesn't work on Mojave. Version 11 Beta is supposed to work on Mojave, but it doesn't. The beta expired so it doesn't launch. I think the developer has checked out because his notes are few years old. Too bad. I was using Anarchy/Interarchy for a long time. So, I'm currently without a FTP program for the mini. It still works on the 17" so that be what I use for a bit. While doing the transfer(s), I moved WeatherCat from the old iMac and I ran it on my 17" MacBook Pro for a short period. I had the same instability issues with WeatherCat when the FTP upload was turned on. The new Mac mini has been stable. So, there must be an incompatibility with 9+ year old hardware. Problem solved. BTW, the screen sharing on Mojave and High Sierra works well. I didn't need to be anywhere near the Mac minis to do any of data transfers. Now that I'm practically done, I'll order and setup the Mac mini monitors. Who would have thought that an App that works in High Sierra, which has an upgrade available that works in Mohave (although Beta), wouldn't work because the developer disabled the App, but you don't know until after you download, install and launch it for the first time. He's gone dark. Probably another computer guy that got bumped off by Hillary. BTW, roaring apps shows that Interarchy works with Mohave. LOL. Actually, it did. It just doesn't now. There are a number of FTP clients out there. You could ask the other WeatherCatters for their own opinions. I'm glad that you have otherwise completed your migration without difficulty. I saw the discussion but ignored it because it was three years old. No big deal though. Sorry, I'm rushing through these postings as quickly as I can and sometimes I'll miss an issue like the date. A bit more digging and I found that the issue appears to be an expired beta. Here is some information on Interarchy support forum. Of course you could try contacting the developer to see what's up. However, it appears that this developer is overloaded and having a hard time keeping up with Interarchy and some other commitments like probably da' dreaded day job. I've been using Fetch for decades but it is still a 32 bit app. The dev is working on the 64 bit version which will be required with OS 10.15 (assuming Apple keeps their word). At least one 64 bit FTP app is Transmit ($45) by Panic Software (a well known company). Thanks. I used Fetch decades ago. I can't remember why I switched to Anarchy though. But, I might as well switch back. But, I might as well switch back. Well, switching back will only work as long as you stay with Mojave macOS 10.14. When we get to whatever comes next, we'll be in the same "boat" unless Fetch gets converted to 64-bits. I'll just put my pennies in a savings account and hope for the best! I do most of my editing of my site in BBEdit and it already has FTP built-in, so I rarely now need Fetch, anyway. I switched from Fetch to ForkLift several years ago, and have been pleased. It's as much a file manager as it is an FTP client, and has a very active German developer. Give it a look. Forklift looks like a more powerful PathFinder (which can't do the FTP thing)! It is already 64-bits! And at the opposite end of the scale: my systems. My WeatherCat runs on a dedicated 24-inch Early 2009 iMac with 4GB of RAM. It's show as molasses in winter, but it works 24/7. It only runs WeatherCat 3 and a program that I wrote to keep track of the water depth in our well. My main system is a 27-inch Late 2013 with 16GB of RAM and 3TB Fusion Drive. It is the everyday workhorse that runs Mail, Photos, Xcode, etc. at a nice speedy clip. I expect that the Fusion Drive helps. Don't know what I'd do with more RAM, my programs would just rattle around in all that empty space. I run Postbox (email) and Firefox during the day and of course WeatherCat 24/7. I also run some sort of audio application all the time and of course other software as the need arises. 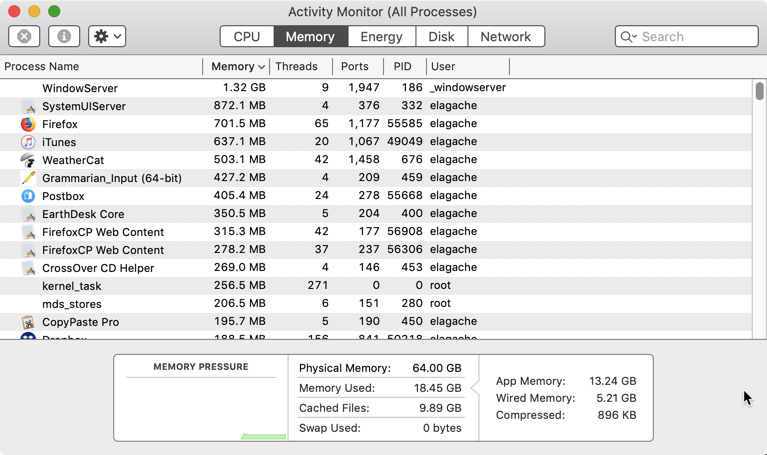 I'm only using around 19 GB of RAM right now, but my MacBook Pro only had 16. Apparently, macOS isn't all that good at coping with limited memory. When there is plenty of it, it does just fine at recovering memory that is released when an application is closed. Instead of having to reboot every few days, now I can run as long as circumstances permit with very little loss of memory over time. It is unfortunate that Apple was slow to increase the optional memory in most Macs beyond 16 GB. I suspect there are a lot of users who are running into problems because that isn't quite enough for macOS to manage that memory with a normal collection of open applications. ...Now that I'm practically done, I'll order and setup the Mac mini monitors. Almost done. I'm building a shelf to store the keyboard, trackpad and hidden power strip so the power cords won't show. It'll be monitor width and mounted above the wall plates. The monitor is mounted to an Ergotron arm and I can swing it all over the place.